For example, divide the hall into several adult classrooms by using free-standing movable partitions. This large area can house several adult fellowship groups (ABFs) and offer a setting for effective teaching by utilizing a small group structure with maximum participation in a conversational tone, rather than the more common, ineffective lecture teaching method. In some instances, we have used a combination of pews and chairs, with the chairs for the back rows of this assembly area. These chairs can be reconfigured into circles for small groups during Sunday school or prayer meeting. 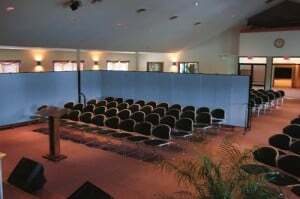 We often design the worship center with overflow classrooms that serve as worship seating as well as adult classroom space. Some churches make the entire worship area a multi-use area by using movable chairs and not pews. I never recommend worshiping in a gymnasium. However, there are other functions that respect the dignity of the worship space. Some believe it ok to also use this space as the fellowship hall when growth and budget constraints make it necessary.